Speaking of Cole Slaw… (Wait, you mean you AREN’T reading these reviews in order, one right after another?… I’ll wait to let you go back and find it… Hint: it’s at the bottom of the review). That was worth the effort, wasn’t it? Anyway, speaking of Cole Slaw, here comes the record that put yet another honking tenor sax man on the musical map. It’s not our first encounter with Frank “Floorshow” Culley, he’d released his debut, Ready For Action, on a smaller label in the fall, but it was with this record and this company was where he first made a name for himself, landing him on the charts and adding to the still-thriving saxophone revolution that had been propelling rock ‘n’ roll ever higher over the past year. If you’d think that they had to be running out of ways to convey the raunchy musical anarchy these songs implied, think again, because as we’ve already seen 1949 was shaping up to be just as wild and unrepentant about that aspect of rock as 1948 had been. Though Atlantic Records rise to the top of the independent label sweepstakes is often said to have begun in March 1949 with the release of Stick McGhee’s Drinkin’ Wine Spo-Dee-O-Dee, certainly a tremendous record with a colorful story which showed the growing savvy of Atlantic’s Ahmet Ertegun when it came to taking advantage of circumstance to get a hit, it wasn’t THAT record (Atlantic 873) which had the longest lasting impact on the company’s fortunes so much as it was the record which immediately followed that release, Atlantic 874, Frank Culley’s Cole Slaw. Or should I say Jesse Stone’s Cole Slaw? Stone was the secret ingredient in this cole slaw, as well as in Atlantic Records’ musical gumbo. Whereas Stick McGhee was a musical vagabond, an engaging singer who’d score again down the road but would never surpass or even come close to matching his one immortal side, and Frank Culley, who were focused on today, would make himself a vital member of the house band for the label over the next few years, as well as cutting some classic instrumental sides on his own, their roles in Atlantic’s success were momentary at best. They were each transient visitors to the roster, entirely welcome in their presence but as evidenced upon their eventual departure from the label, easily replaced as well. On the other hand Jesse Stone would never be fully replaced once he left Atlantic and while the company built their commercial empire further in his wake, musically speaking they never again shaped the direction of rock nearly as much after he left in 1958. HE was the one who’d set Atlantic on the musical course to infamy and while Ertegun stated bluntly that Stone was more responsible than any for the sound of rock ‘n’ roll, Ahmet’s actions never equaled his words when it came to giving credit. But alas this isn’t the END of the Jesse Stone story, only the beginning, so rather than focus on that aspect of his saga our perspective shifts back a decade from when he left to the moment when he arrived, already a music veteran with a long track record of success as a songwriter and arranger. We first met him in a roundabout way back in October 1948 when The Trenier Twins covered his recent release Hey Sister Lucy, but that was only a mere mention of him, a teaser if you will. This is where his legacy in rock really begins and while he’s far more deserving of a full length biography to cover his 98 years on earth that’s more than we have room for here, so in lieu of that this brief overview will have to suffice. Stone was born in 1901, making him already of an age that was unlikely to have any positive contribution to rock ‘n’ roll by 1949. Yet Stone was just getting starting in reshaping rock’s possibilities. He’d been born into a musical family, his father was a producer for minstrel acts, his mother a songwriter and Jesse himself began on stage as a four year old. He’d played violin, later switched to piano and by 25 years old led his own band as well as writing songs. It was at that point where he really started down the road that he’d soon make his name on by becoming an arranger in the studio for a wide array of artists. He still led his own group and by the 1930’s they were quite successful around the country. In fact Louis Jordan, the most important immediate forefather of rock ‘n’ roll, got much of his style from Stone, who was arranging for Chick Webb, the band which Jordan was ensconced as an alto saxophonist. Jordan’s start as a singer was overseen by Stone who crafted the material to suit Jordan’s unique attributes and when it went over well Jordan set off on his own, taking Stone’s own band to back him in the process! Thus Stone’s impact on the future off-spring of Louis Jordan’s style was already secured, if not exactly publicly recognized or historically acknowledged, but Jesse wasn’t content with that. As always when it came to music and to life he was looking forward. 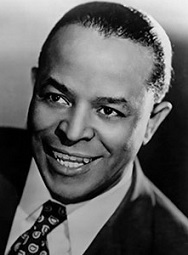 He progressed rapidly as a songwriter in the 1940’s, scoring hits starting in 1942 and a few years later landed at National Records with Herb Abramson in charge. When Abramson left that company and joined Ahmet Ertgeun to form Atlantic Records in 1947 Stone was eventually brought on board to shore up the musical side of the equation. In early 1949 saxophonist Frank Culley was signed off the clamor his live gigs had been making around New York and during his first session he auditioned a song that he claimed he wrote which based on responses he’d been getting playing it around town had strong potential. Unfortunately for Culley the man who ACTUALLY wrote it – as Sorghum Switch back in 1942 – was sitting in the studio conducting the session. Namely Jesse Stone. Luckily for Culley’s sake Jesse Stone wasn’t a vindictive man and saw, like Culley had, that his earlier composition had potential in the new world of rock ‘n’ roll. Stone promptly re-arranged it to further suit this booming genre of rock and with that Frank Culley’s career took off while Atlantic’s fortunes increasingly became intertwined with the contributions of Jesse Stone. Stone also renamed the song Cole Slaw, surely in part because of the recent success that Hal Singer had gotten with instrumentals named after southern barbecue staples, like Cornbread. After all it pays to appeal to the constituency that was going to be targeted for this music and that meant black audiences, many of whom were either living in the south or had migrated north over the past decade. Besides, as stated before, an instrumental’s title was merely something that needed to be distinctive enough to serve a purpose that a song’s lyrics otherwise would provide – to be memorable. But that wasn’t the ONLY reason it received this new appellation, as New York’s WOV radio had a dee-jay named Max Cole and so the song’s new title also served as a form of payola, an unfortunate trend that continued long after it’d been shown to hurt as much as help should other radio stations decide they had enough of promoting their competitors by playing songs dedicated to other disc jockeys. As for the song itself the most notable version of the original “Sorghum Switch” had been done by white bandleader Jimmy Dorsey back in’ 42 and the makeup of Dorsey’s band plays a huge role in the presentation of the original. He led a typical swing band with full brass section playing in a subdued manner, almost always in unison, though there the alto sax went off on its own a little at times. The drumming was incidental, just a way to keep time and not add any emphasis to the proceedings. The melody though remained the same as is found here and carried the song with panache. It was pleasant, light big-band fare perfectly suited for the times. Likewise the reimagined Cole Slaw is perfectly suited for ITS time, as Stone added a subtle bass line and gave the drums a little more presence to provide a bottom from which to work from. He also added parts for a guitar to play off the primary instrument, thereby adding a counter-melody and allowing for a more dramatic contrast during the give and take between the two instruments, increasing the tension noticeably. The main draw however remains the dominant and instantly memorable melody which falls to Frank Culley to carry off which he does with aplomb, using a warm soothing tone throughout the bulk of the record, before digging deeper at the midway point, adding enormous grit to the lines as it goes along and squarely placing it in the rock alley. His soloing isn’t nearly as flamboyant as a lot of what we’ve seen to date, there’s a lack of the raunchy low notes and the squealing high notes that have shaped much of rock’s instrumental direction to date, but his intensity still comes through during these sections and its contrast to the “verses” that open and close the record keeps it from ever wandering into a milder realm as anyone who heard Dorsey’s prototype must’ve surely been dreading. Stone’s arrangement and the pace they set it at it allows for your interest to build gradually over the course of the record, maintaining, then increasing, its driving momentum throughout, as Culley’s horn hints at eroticism and seduction at times without ever veering into the stripper’s anthem techniques others were inclined to pursue. They don’t go for the garish displays to grab your attention momentarily with something shocking but rather they ease you into a groove to make sure that once they have your attention they keep it. The song’s story doesn’t end there, with Culley’s hit version (#11 during a three week run on the national charts in the spring) affirming its commercial appeal. Stone recognized it had even more possibilities and promptly wrote lyrics for it and recorded a version himself for RCA, his light pleasant voice delivering them with a sly wink and nod. Ironically he didn’t go quite as far musically as Culley had, pulling back on the fresher sounds, probably in an attempt to court a different audience than Culley was attracting and therefore double its reach. It accomplished that too, though not in quite the way Stone had probably intended, for not long after his old friend Louis Jordan essentially combined the two versions, adhering more to the Culley-introduced sax aesthetics (though the rest of the arrangement is far more subdued and thus outdated) while singing Stone’s lyrics in his inimitable manner, lending them a smile-inducing quality that made the song sound deeper than it actually was. He wound up having the biggest hit with it (ten weeks, topping out at #7), as befitting his own still-unquestioned star power, as well as having the more powerful label (Decca) with which to promote it. But Jordan’s rendition was for yesterday’s audience, still powerful in numbers but gradually fading from prominence and playing increasingly less of a role determining the hit sounds of today and especially in predicting the sounds of tomorrow. For that it was left to guys like Frank Culley, who while not doing so with an original song and in this case reliant on the more established Jesse Stone to adapt his own older composition for the new market, was nevertheless better equipped to deliver what rock fans were demanding sonically with the groove-inducing tenor sax sounds that were defining the music going forward. Cole Slaw was better in construction and more seductive in its ambiance than the typical rock instrumental for the time and its backstory was anything but typical. But audiences then just cared about the sounds they heard and would listen to the best of them for as long as it held them in thrall before the next record that won their allegiance took its place. They had little awareness of the figures behind any of these records and presumably little interest. For that it was left to us seven decades down the road in telling rock’s larger story by focusing on the smaller mostly forgotten stories – and the long overlooked behind the scenes creative geniuses like Jesse Stone – who made rock the musical revelation it became along the way. 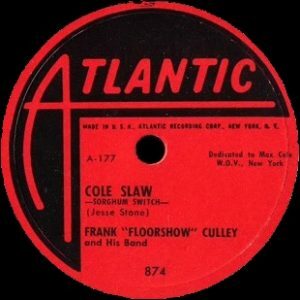 Leave a reply on "Frank Culley: “Cole Slaw”"